Siberian composer John R1se (AKA Evgeniy Akimbaev) is one of those talents that is inexplicably hidden away. Blending classical, electronica, and rock music. John R1se is an instrumental project that should quite rightly be scoring big budget sci-fi films. The project has only been around for year but has already yielded an EP that is hard, heavy, cinematic and addictive. It's John Williams meets Juno Reactor. The title track 'Overcome' is a solid opening credits theme with it's initial orchestral swell leading into heavy electronic rock with elements of dubstep lightly sprinkled throughout. 'Peacemaker' on the other hand is the emotional scene playing out as a star destroyer burns in the heavens with horns and strings drilling the emphasis home over the electronic ambience. 'Magnum' picks up the pace as the action intensifies with the ambient electronics and orchestral elements giving way to a modern electronics in a wonderful breakdown. 'The Event Horizon' blends sweeping ambience with martial beats to build a foreboding sense of scale as an imperial armada masses on the edge of a distant galaxy. The final track 'Emperyan' rounds off the EP in a classic end credits manner after the shock cliffhanger sets up the sequel with epic strings building, hard dubstep breakdowns and a slow fade out as the screen fades out. The two remixes are okay with their emphasis on the more techno and dubstep elements of the EP creating a couple of good dance tracks. However they feel tacked-on and unnecessary as the original tracks are a complete statement in their own right. The albums is wonderfully produced with the mix truly matching the scope of the composition and sound design. It achieves that cinematic sense of space that creates emotional resonance with each subtle change. 'Overcome' is a stunning début EP that promises a lot more to come. If there is any justice in the world Akimbaev will be scoring films and releasing albums for years to come. 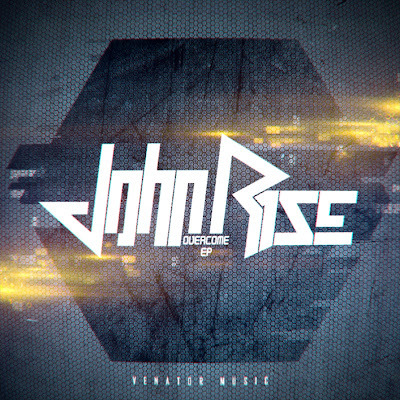 If this EP is anything to go by, a full-length offering from John R1se will be something special. Definitely one to keep and eye on.